Blogger has introduced their lightbox plugin to showcase images in Blogger blogs. Clicking on an image in a blog post will brings up the image in a larger overlay on top of your blog, called a lightbox. All blog images from the same post will now appear as thumbnails along the bottom, which can be easily browsed by clicking the arrow keys on the left or right side of the lightbox. 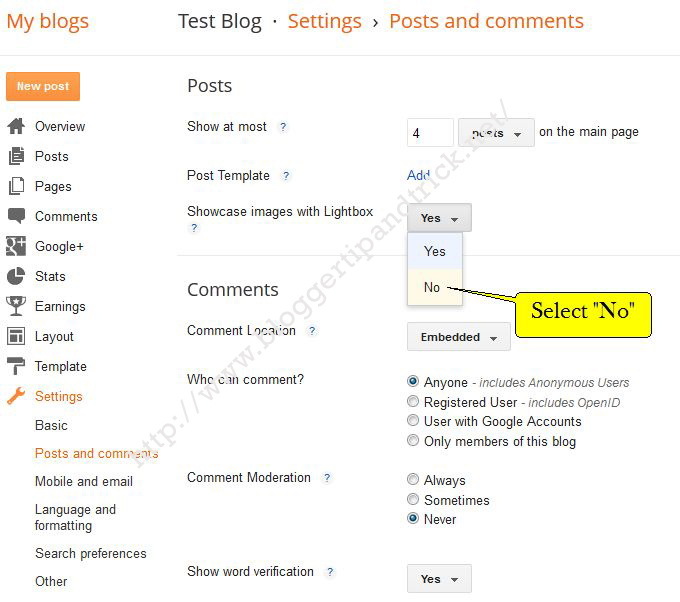 But if you do not want to use this Blogger lightbox feature or if you have already using other lightbox plugin, you can disable it easily using Blogger settings. 1. First go to "Settings" of your blog. 2. Click on "Posts and comments" link under "Settings". 3. Under "Posts" settings section, you can see option "Showcase images with Lightbox?". Select "No" from drop-down menu. Now you have successfully disabled blogger official lightbox.